Just last week, T. Boone Pickens returned to The Daily Show to discuss how natural gas was a safe energy resource that the U.S. had plentiful supplies of that it could use to wean itself off its dependency on foreign oil. However, when Jon Stewart brought up the subject of "fracking," Pickens got tongue-tied. That's probably why he and every major natural gas executive in America refused to be interviewed about the process for Josh Fox's documentary GasLand, which details the destruction that has been unleashed on people, animals and the environment by the practice. 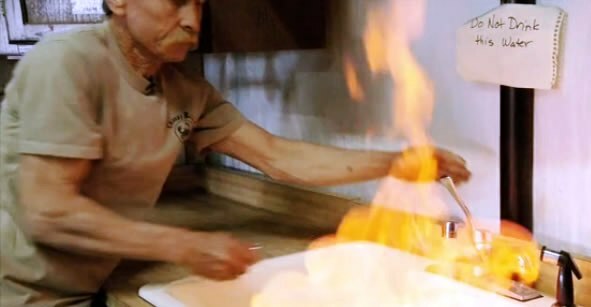 Fox had never made a documentary before but sort of stumbled into it when he noticed the changes happening in the creek near his family home in rural Pennsylvania following an offer from Halliburton to lease the family's land for natural gas exploration. While they would receive a few hundred thousand dollars from the agreement, as had many rural Americans across the country, they'd also encounter poisoned water sources, dead animals, health problems and more, all which seem to stem from the process used to retrieve the natural gas. It inspired Fox to go on a cross-country journey to other sites to see the damage done by the hydraulic fracturing (or fracking) process, which the companies insist were safe but which evidence proves otherwise. In a way, it doesn't matter because the 2005 Energy Bill, formed in the wake of the secretive Cheney Energy Task Force, exempts all energy companies from safety regulations that had been in place for decades, some dating back to the Nixon Administration, so the corporations basically can do whatever they want in the least-expensive way without any concerns for the safety of nearby residents, the companies' own workers or the environment itself. As one man tells Fox, "Amazing. What took millions of years for Mother Nature to build can be destroyed in hours by heavy equipment." If only the equipment were the main problem... What's really causing all the destruction is the seepage of a virtual stew of hazardous chemicals that are used in the fracking process to retrieve the natural gas. It's pretty amazing to watch scene after scene in state after state of people putting a lit match next to a flowing faucet or a stream and see the flames burst forth. There are other stories that you hear repeatedly as residents complain about contamination only to be told that the water is safe by government or company officials, who then refuse to drink a glass of the tap water when the residents offer one. It's even more disgusting when Fox meets with representatives of state departments of environmental protection and they speak the corporate party line, denying that contamination is as widespread as it is, or at congressional hearings where executives testify that there isn't any evidence of risks and the happy House members, including a particularly dumb-looking and sounding Rep. Dan Boren, D-Okla., side with the businesses. Meanwhile, Fox learns of those who have contracted cancer and died, the risks of brain damage from repeated exposure, pets losing hair and a Colorado woman who keeps the corpses of mass and sudden animal deaths preserved in her freezer for any potential investigations. Even more frightening is learning how Hurricanes Katrina and Rita scattered the junk from hundreds of thousands of sites all over the place. GasLand turns out to be a pretty good effort for a first-time filmmaker such as Fox and another example of a documentarian doing the investigative work that the Fourth Estate has abandoned. You do learn a lot, though he tends to repeat himself and I don't think it belongs in Oscar's final five documentary features compared to some of the other finalists and nonfinalists from 2010 that I've seen. Still, it's very good and yet another case of showing the indifference both corporate America and our elected leaders have toward the average citizen's wellbeing.